Dr. Michael Heckman was born in Iowa. He has been practicing orthopedic surgery and sports medicine in South Texas since 1989. Dr. Heckman earned his Doctorate in Medicine from the University of Texas Medical School at San Antonio in 1983. 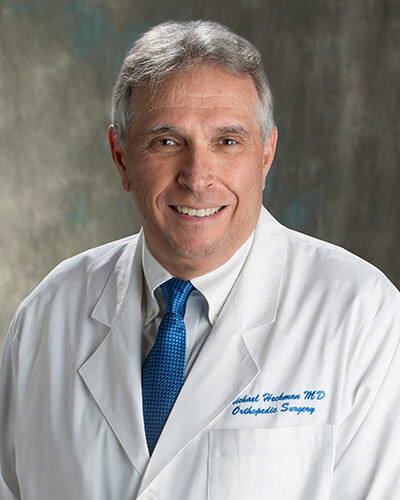 Dr. Heckman completed his surgical internship in general surgery at Emory University(1983-84) and his residency in orthopedic surgery at Emory University (1984-88). Dr. Heckman is certified in orthopedic surgery and in orthopedic sports medicine by the American Board of Orthopaedic Surgery and is a fellow of the American Academy of Orthopaedic Surgeons. He has been selected by his fellow physicians as one of the “Best Doctors in America” for the last 20 years and one of the “Best Doctors in San Antonio” as well.Following his residency, Dr. Heckman completed an Orthopaedic Sports Medicine and Arthroscopic Surgery fellowship at the American Sports Medicine Institute in Birmingham, Alabama. Under the supervision of Dr. James Andrews, MD, he learned about the specialized treatment of injuries in athletes from those in high school to nationally known professionals. During his fellowship year he was provided with the opportunity to work for four months with the Orthopaedic Associates of Aspen, Colorado treating injured skiers from both the Aspen and Snowmass ski areas. He completed additional post-residency specialty training in 1991 with Dr. Charles A. Rockwood, MD at the University of Texas Health Science Center at San Antonio Department of Orthopaedics focusing on surgery of the shoulder. Dr. Heckman is a Clinical Assistant Professor for the Department of Orthopaedic Surgery at the University of Texas Health Science Center at San Antonio. He is actively involved working with the Orthopaedic residents daily both in his office and the operating room instructing them primarily in arthroscopic surgical techniques. Additionally, he provides assistance and guidance with ongoing Orthopaedic resident research projects involving sports medicine, arthroscopy, and mesechymal/stem cells applications for ACL reconstructions, rotator cuff repairs and arthritis. Dr. Heckman is professionally affiliated as a Fellow of the American Academy of Orthopaedic Surgeons and has served the Academy as a member of the AAOS Sports Medicine Advisory Committee from 1998 – 2004. This AAOS committee is responsible for writing the Orthopaedic Sports Medicine Assessment Examinations used to test and instruct other orthopaedic surgeons on the advances and changes in sports medicine. Dr. Heckman specializes in performing arthroscopic procedures on the knee and shoulder including ACL reconstructions, ACL revisions, arthroscopic shoulder stabilizations and rotator cuff repairs. He is utilizing autogenous mesenchymal cells in his practice as part of ongoing research. Specializing in knee and shoulder surgery and Sports Medicine.